Urethral stricture is a well-known complication after transurethral surgeries. 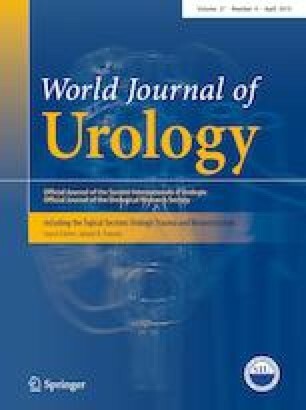 The incidence of urethral stricture after transurethral resection of prostate (TURP) varies between 2.2 and 9.8%. Most of the cases present within 6 months of transurethral surgery. Presentation is likely with poor flow, urinary tract infection or acute retention. A prospective study was undertaken from January 2010–June 2017 for the management of post TURP stricture. A total of 170 patients with stricture urethra due to TURP were studied. The age of patients was 54–87 years (mean age 67.34). The mean preop Qmax was 6.1 ml (range 0–15). The length of stricture varied from very short in the proximal bulbar to pan urethral stricture. Out of 170, 94 were treated with dorsal approach, 71 with ventral approach and 5 with simultaneous distal dorsal, proximal ventral approach. Five patients underwent endoscopic procedure. Mean BMG length was 6.25 cm (4–8) and width was 1.5 cm (1.3–1.8). Overall success rate was 82.43%. Urethral stricture is a well-known complication after transurethral surgeries. Post TURP can cause stricture at any part urethra. BMG mucosa Urethroplasty is the safe, feasible and offer long-term success in these patient and should be strongly considered over CIC and VIU. Ventral approach is best suited for proximal bulbar strictures close to membranous urethra. This is a continence preserving surgery.